Wednesday December 23rd 1903 It was late when we got up this morning. I was busy all morning with the work. I sewed on my waist in afternoon. I read and knit in the evening. Mollie busy making out reports. 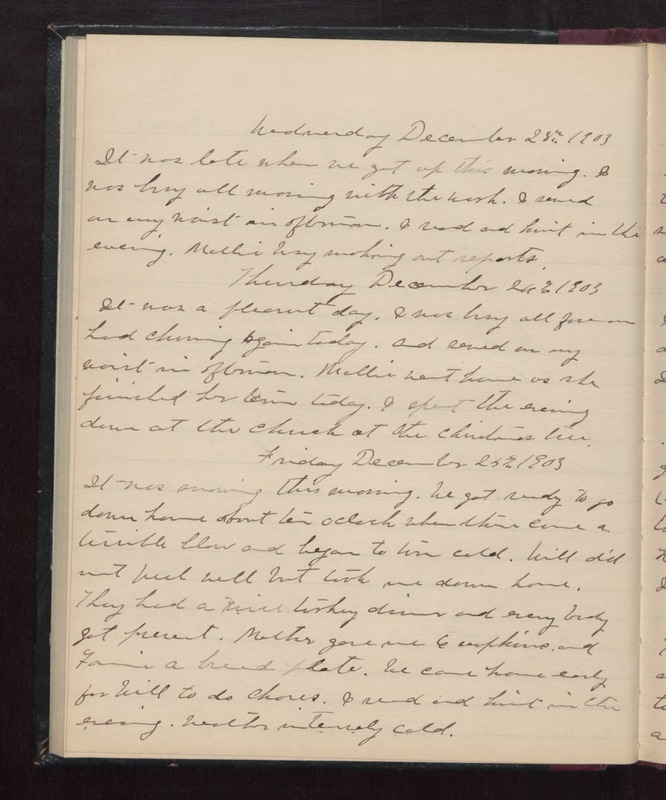 Thursday December 24th 1903 It was a pleasant day. I was busy all forenoon had churning again today and sewed on my waist in afternoon. Mollie went home as she finished her term today. I spent the evening down at the church at the Christmas tree. Friday December 25th 1903 It was snowing this morning. We got ready to go down home about ten oclock when there came a terrible blow and began to turn cold. Will did not feel well but took me down home. They had a nice turkey dinner and every body got present. Mother gave me 6 napkins and Fannie a bread plate. We came home early for Will to do chores. I read and knit in the evening. weather intensely cold.